This is your related Core Deposit which will be refunded to you once you return your old sterndrive. You have 15 Days to return the old out drive. Our core program is not a requirement for the purchase of a selected product, however this is for customers whom wish to receive credit for the unit that is non-useable. This is basic guidelines for retuned cores. * Each core that is received by us is evaluated to assess its value as a core. * The condition and usability of the parts determine the value of the core. * All parts must be in the core regardless of condition. Missing parts will be charged at 50% of the core value. * The core returned must match the product purchased. States excluding Alaska and Hawaii. 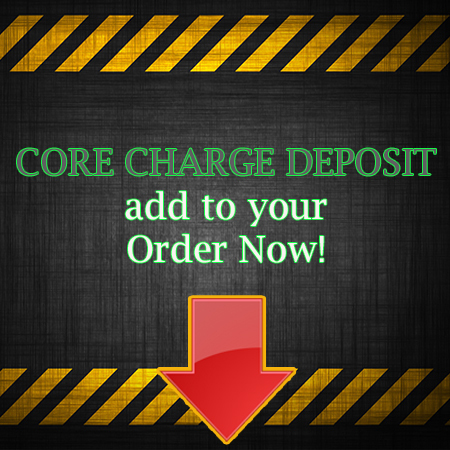 * Simply place your core in the original box and place the label on your package. * Call a toll free number on the label for prompt pick-up. unless otherwise notified in writing. HOW WE EVALUATE WHAT YOUR CORE IS WORTH? * A defective-free housing represents 50% of the core value. * A good drive shaft represents about 25% of the core value. * A good prop shaft represents about 25% of the core value. amount would be returned within 30 days. Matter as long as all of the parts are present.